James. It was decent but he wasn't finishing things. His arms at times, other times his feet. Overly praised from the Judges. Over scored. Billy Dee. It's probably a good thing he can't dance tonight. Nene. Better than her other two dances. But her hip swivels looked awkward. There was no other hip action. The leg action was wrong too. I don't know if part of it was due to being barefoot. Over scored. No 8s, 7s at best. Cody. Felt more lyrical hip hop than jazz. And it seemed one level to me. 8s at best, not 9s. Danica. I liked it. It flowed nicely. For the first time tonight, the Judges weren't obey praising. I'll give them the scores. Drew. I liked the dance but he looked heavy, the rise and fall was not smooth. He could've been smoother throughout the whole dance. Can I have Cheryl's dress? I'll agree with the scores. Meryl. Beautiful foxtrot. There's bit much I can pick on. I'll agree with the scores. I'm getting there. I spent more time stitching this week. If you recall, this was last week's progress. I managed to finish outlining the dragon. But was this the end of my backstitching? Nope. The dragon needed gold scales and the background needed some cross-hatching. Two different colors. The second went a little quicker because I had a reference in front of me rather than having to refer to the backstitch chart. Yes, there are an extra four pages just for backstitching placement. Now, that that's over with, onto the beads! I essentially have to put four around the spots where the blue hatching cross, and also in the blank spot in the blue of the border. This may take me all week. My monthly update. It hasn't really changed much. 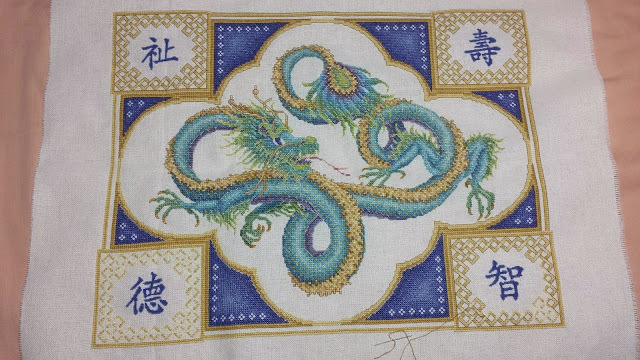 I stitched on Celestial Dragon and Insanity. I've done more than this picture shows but I'm saving that for my regular blog post. 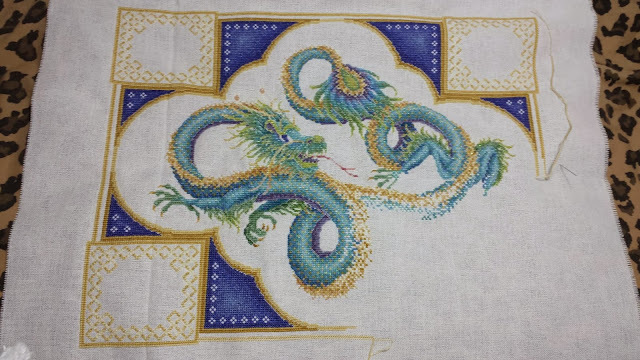 I may be able to get the dragon done by the end of the month. And I've spent nothing. Well on cross-stitch stash anyway. I did buy materials to make a pair of jeans, which I will do soon, I just need to make sure the pattern is right and that means making a pair of shorts in muslin, or maybe broadcloth. 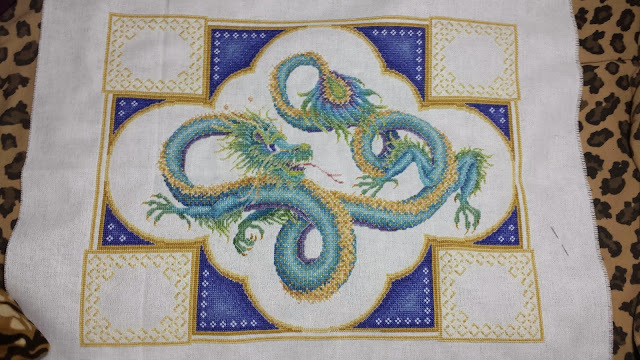 Either way, I haven't really had the time to sew, too busy trying to finish the dragon and getting involved in a game. First off, much better opening than last week. Drew. Entertaining but sloppy. Latin is going to be challenging for him through the rest of his season. Don't think it good enough for 7s. Danica. No bounce, knees were bent the entire time and she needed to finish her arms. Carrie ann was watching a student dance than me. I like her dress. Better than Drew's Jive but I don't know if it was 8s. Billy Dee. He did more than last week but looked liked he was marking it. Too minimal, Emma and the girls were doing so much more than him. He's sweating more than he should be given the effort I saw. Meryl. Very jitter bug. But definitely swing. I enjoyed it. I'll agree with the scores but could've been a bit higher. Diana. That is why she went home. Not good and zero fan base. I have finished all outlines. Does this mean I'm finished? Not by a long shot. Although the backstitching is a time when I find I've missed stitches. Espeically quarter stitches. I have to put in at least 10. And also move a toe over because it would've messed up something I still have yet to stitch. My new game has taken up more time that I probably would like, although I'm not going to quit it just yet. I also was not chosen to sing the national anthem at graduation. I'm also still hearing crickets in regards to my job search. I didn't like the opening. Too much focus on Jason Derulo and not enough actual dancing by the pros. NeNe. 2/3 of the dance was not dancing. Saw very little cha cha and wasn't well executed. She performed but I don't know if her personality will endear most of America. Scored too high based on what I saw. Jason. Very choppy. No smooth connection between steps. A little high but more worthy than NeNe. Danica. Not bad. Once I got past the music choice. I liked it better then Jason's. I'll agree based on previous performances. Sean. Karina was pretty but it felt a bit flat. Hmm... lowest score for now. Billy Dee. Uh. I could barely pick out the steps. 5s are being nice. Meryl. Clean, good lock steps. Need to straighten her knees a bit more. Best cha cha of the night. I'll agree. Candace. Interesting but a bit one note with the choreography. Not that it wasn't well done. Don't think it deserved a 9. I didn't get quite as far I had hoped to with the backstitching. Still on the first color, but it's probably the most used. auditioned to sing the national anthem at my graduation ceremonymet with a teacher to redo my resumeactually redid my resumewrote a cover letterdiscovered a new game Maybe my new resume will get me a few more responses. Back to stitching for the day. I'm late on my update again. I have a really good reason though. I spent Sunday finishing up my tailoring on my fringe dress and then made a shirt. I'm having trouble with the hem on the top otherwise I'd have a picture of it. I may make bias binding and finish it that way. 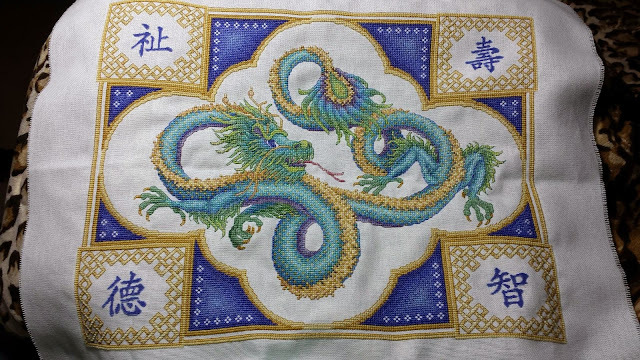 On Thursday, I finished the over 2 stitching of my dragon. I then started on the over 1 Chinese characters. By the end of Saturday I had a little over one to finish so I decided to wait, thinking I could finish it up after I got back from the competition the next day. We made top 24 and the quarter-finals for silver latin. But given the amount of entries and how long it was between the heats, they were running in level order rather than finishing up newcomer/bronze before starting silver/gold, I didn't get home as early as I thought. Therefore, I had to finish the characters today. It's that time again. Dancing with the Stars has announced their new cast. Time for my opinions and predictions. Sean Avery and Karina: I don't follow hockey so I have no idea who he is. When I watched the cast announcement I didn't feel like he had much of a personality. The only little bit was when he spun Karina at the end. He's the sports player for the season but I don't know how far he'll go. Candance Cameron-Bure and Mark: I used to love Full House. That being said I don't know how big the fanbase for her will be so hopefully she can dance and Mark doesn't do odd choreography again. Drew Carey and Cheryl: He's lost a lot of weight. If I hadn't seen the announcement, I would've put him in the 'not going to be able to move' category. Now I'm not sure. He is funny and it will probably keep him around for a while. I have reached page 4 of Celestial Dragon. Tada! A better picture than the last few weeks. And this time you may actually see a hint of sparkle on the dragon. Hopefully won't be too long before this page is done and I can go on to complete the over 1 sections. But then comes the backstitching. That alone will take me over a week. Not to mention the beads. Last night my Mom wanted me to sew something so I pulled out all my patterns. As we were going through them, I found out a few things. I need a bigger box, or at least a secondary box.I have more patterns for woven fabrics than stretch fabrics despite it being the opposite for what's actually in my stash.I need a better organization. Although in light of that, I believe I have finally matched a pattern to a piece of fabric from my stash. The pink being the main fabric with the gold and the other two colors being the wrong side of this fabric (visible on bottom right corner). What do you think?